The Bayonne Bridgemen, now a performing arts group, marched in the St. Patty's Day Parade in Bayonne and recently competed in Boston. When the Bayonne Bridgemen in their iconic yellow jackets appeared marching in the St. Patty’s Day Parade on March 17, the crowd’s cheers would have overwhelmed a movie star. The Bridgemen, once a world-renowned group famous for its radical hijinks, has evolved from its drum corps roots. The group became an alumni drum and bugle corps in 2004 then hung up their horns in 2016, going out on top at the Drum Corps International Eastern Classic. Now, the group marches on. It reorganized as the Bridgemen Performing Arts Organization and continues to perform in the community and across the region. The group hasn’t re-enacted its fainting gag that made it world-famous at the 1976 DCI World Championships. In that performance, the entire drum and bugle corps collapsed on the ground simultaneously, as if knocked over by the heat of summer. It was a radical performance at the time for a drum corps, which was modeled after the Marines. They were poking fun at their uptight Marine-like competitors, much like the way the Marines poke fun at the Army, and the Army pokes fun at the Navy. DuCharme’s mother was the director of the Bridegmen in the 1980s. The group is made up of many alumni who keep the tradition going, as well as some newcomers. 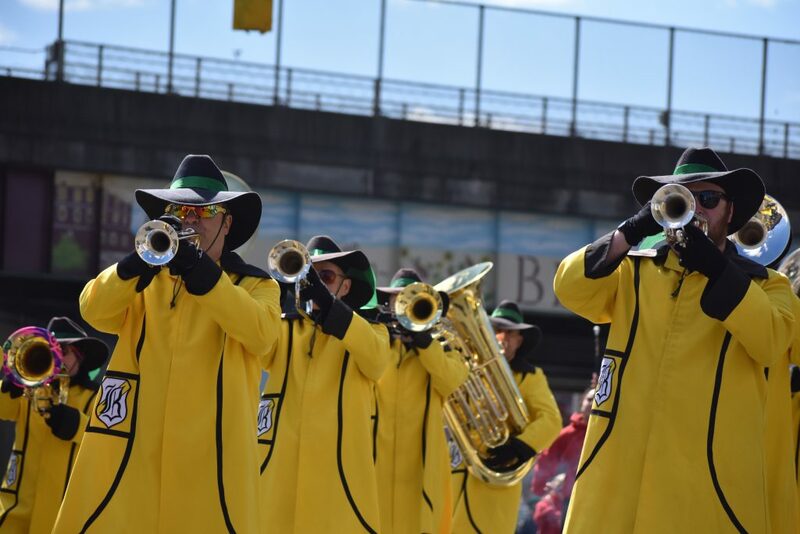 The musicians continue to play in Bayonne, such as at the Bergen Point Christmas festival, at Buddy Baseball events, Flag Day at the Elks Lodge, and the May Day celebration in Bergen Point. The group is planning to perform at the Bridge Arts Festival in Bergen Point in the fall. DuCharme’s husband, Rich, joined the performing arts group after a lifetime of playing trumpet. He admired the Bridgemen from afar and was excited to join when the opportunity presented itself. It’s not all Bridgemen alumni and older folks getting involved. Rob Lais, in his 30s, joined the Bridgemen Alumni in 2015, a year before it transitioned to a performing arts organization. The youngest member is 15 and the oldest is 65. The group now has 25 members, with four from Bayonne. Some come from as far away as New Hampshire, Virginia, and Canada. For updates on this and other stories check hudsonreporter.com and follow us on Twitter @hudson_reporter. Rory Pasquariello can be reached at roryp@hudsonreporter.com.